Guess what? 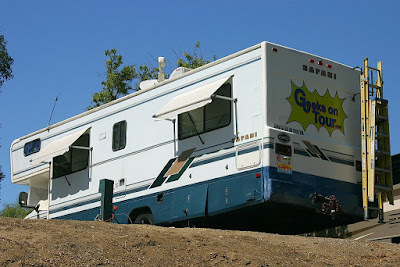 There are other things you can do while living in an RV besides eat, drink and play with computers! At least that's what we're discovering here at Ramona Canyon. As soon as we pulled in here and Jim was outside getting us all hooked up, someone came by and recruited him for water voleyball! Fun. 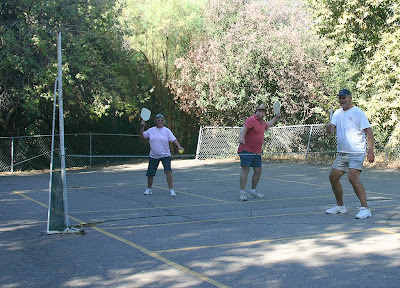 Then, one of the people playing voleyball invited Jim and me to play Pickleball in the morning. Oh Boy! Pickleball. We had to leave Pio Pico because our Thousand Trails membership only allows for 2 weeks' stay, then, we have to be out of any Thousand Trails for one week. We have another membership at Resorts of Distinction, which is what brought us here. 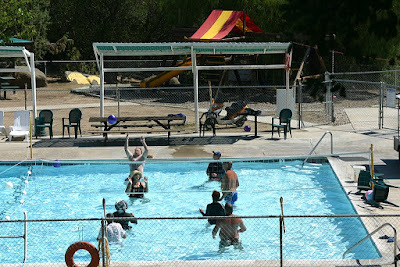 So, we'll be here for one week, then go on to another Thousand Trails in Palm Springs. As long as we stay in membership parks, it's free. Yeah, I know, nothing's *free* - 'prepaid' is probably a better way to put it. We paid a bunch of money for the original membership, then we pay annual dues. But, when we stay at a park, there's no charge at that time. It's actually *very* nice. And, most of the parks are great. Here's our site at Ramona ... notice our new Geeks on tour sign! Pretty cool huh? Thanx American Trophy for getting that decal made for us!